The 12-Day GoodBelly Reboot Results: Do Dairy-Free Probiotics Work? You are at:Home»Alisa's Blog»GoodBelly Reboot Results: Do Dairy-Free Probiotics Work? GoodBelly Reboot Results: Do Dairy-Free Probiotics Work? Tony and I do almost EVERYTHING together. We’ve worked together for 20 years. Our time off is spent on long walks, trips, and just shopping, together. New endeavors like P90X are tackled together. And yes, he even went strictly dairy-free with me many years ago. So when I was asked to take the GoodBelly Reboot, it was a no-brainer – the husband and wife challenge was on! This post is sponsored by GoodBelly in honor of their 12-Day Belly Reboot, which officially begins on January 19th! But the opinions are my own and the results are 100% honest. In fact, as a result of taking the GoodBelly Reboot, Tony & I are now regular purchasers of GoodBelly StraightShots! Going strictly dairy-free resolved MANY of my digestive issue, particularly the severe ones. But the decades of dairy assault left behind some IBS-like symptoms of irregularity. I’ve also had bacterial overgrowth found in my gut in the past. The doctors said it was likely from childhood antibiotics. Dairy caused many chronic infections for me when I was a kid (ear, nose, eyes), and consequently, I took more treatments than a little one should! Tony has more general tummy troubles with irregular digestion, chronic bloating, and moderate diverticulosis. He’s been tested and does not have celiac disease or any other known conditions. They previously found bacterial overgrowth in his gut, presumably from the long-term antibiotics he had to take as an adult. And like me, he had an onslaught of childhood infections followed by short courses of antibiotics. Both of us have taken different probiotics over the years, so I wasn’t expecting anything notable from the GoodBelly Reboot. Fortunately, I was wrong! I’m not a juice drinker, so we enjoyed the oat milk-based SuperShot and StraightShot beverages over the course of our GoodBelly Reboot (and beyond!). The SuperShots have just 5 grams of sugar and a whopping 50 billions probiotic cultures. They also come in two yummy flavors: Lemon Ginger and Vanilla Chamomile. The StraightShots have just 3 grams of sugar (none added) and a mighty 20 billion probiotic cultures. I started the GoodBelly Reboot with a daily SuperShot and had almost immediate rumbling. I was surprised since I’d never felt such action with any other probiotic brands. This one was doing something! Tony took the StraightShots and promptly got some tummy pain and bloat each day. The grumbling persisted for me, but in a good way. My stomach wasn’t upset, it was just “busy”. Tony’s additional bloat subsided, but he could now feel some serious action. I decided to try the SuperShot in a thick, spoonable smoothie. Enjoying it with food did reduce the rumble, and I didn’t have my usual “post-smoothie” bloat. Tony said his digestion was starting to feel more “normal” and the rumbling had almost completely subsided. Tony decided to give the SuperShot a try and his stomach let him know that an invasion was underway. In fact, it was all out war! GoodBelly really seems to deliver on those probiotic quantity claims. I “downgraded” to a StraightShot and my tummy was happy and relatively calm. Tony kept up with the SuperShot, encouraged by the battle ensuing. He said it didn’t seem quite as bad, but was still going strong. Smitten by the somewhat neutral flavor of the StraightShot, I began experimenting with morning smoothie flavors. And I continued to feel great after eating them. Tony said his digestion had improved significantly. He still noticed some activity when he took a SuperShot , but his body now handled the StraightShot with ease. He even described his digestion as “very regular”, which is something he hadn’t said in years. I decided to keep up with the StraightShot for maintenance at this point. My stomach was feeling calmer and also more consistent than it had in ages. We were both so pleased with the results that I printed out a coupon from the GoodBelly 12-Day Belly Reboot site and immediately bought three more packages! We’re working out way through those now, and plan to buy more. But is it Worth It Long Term? I had it set in my head that GoodBelly was a luxury item. Although I hadn’t done the math, I assumed it was far more expensive than taking pills. You get what you pay for, right? GoodBelly is tastier and more fulfilling than taking pills, so it simply had to be a treat for the rich and famous. But while at the store, Tony pointed out that GoodBelly was generally less expensive than equivalent probiotics! Are you telling me that a high-quality, dairy-free probiotic, which I actually remember to take because it tastes good, is the value option?! In stores and online we looked for dairy-free probiotics with equivalent levels of cultures, and indeed, GoodBelly cost less by anywhere from 25 cents to a dollar per day! Not to mention, it doubles as the creamy liquid in my smoothie, reducing my dairy-free milk beverage expense! GoodBelly is a delicious beverage that contains exclusive live and active probiotic cultures, called Lactobacillus plantarum 299v (LP299V®). According to the research, these cultures help to improve the digestive health in your gut (where 70% of your immune system lives!) and have shown benefits in battling IBS symptoms. And unlike many probiotics, GoodBelly is dairy-free and vegan. It’s cultured on oat flour rather than dairy. 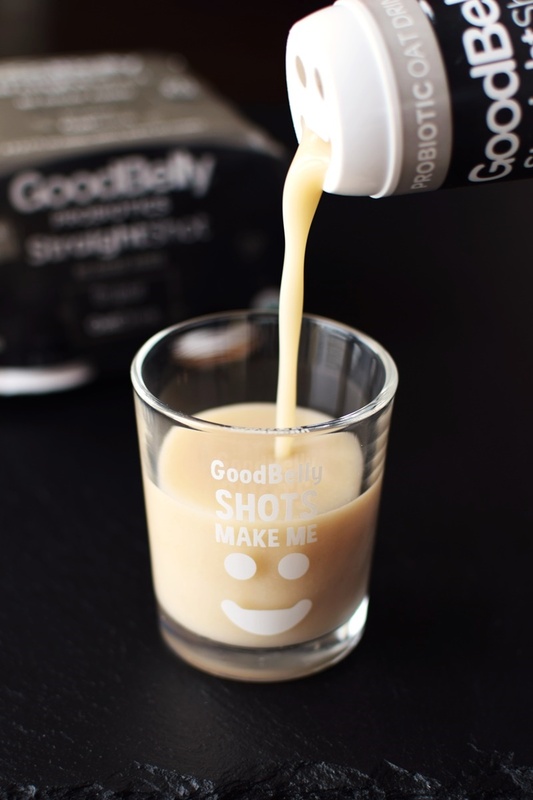 GoodBelly is available in the oat milk-based shots that we enjoyed, and in several tasty JuiceDrink varieties sold in multi-serve cartons and as concentrated PlusShots. They do have some certified gluten-free flavors in the JuiceDrink carton line-up. GoodBelly also offers some new Protein Shakes, which I can’t wait to try! Take the GoodBelly 12-Day Belly Reboot! Of course you can take GoodBelly Probiotics any time, but I recommend signing up for the GoodBelly 12-Day Belly Reboot for free online. You immediately get a great printable coupon and are entered to win in their big giveaway! They also have an easy and fun online symptom tracker, and they send out motivational and informational emails for guidance. I found papaya enzymes here in Germany. I started taking them yesterday and will let you know how it goes. Make sure to take those with meals – they’re digestive enzymes. They don’t help with “good bacteria” repopulation, but can help with food digestion issues. Love your daily log! When my now 6 year old was an infant he had chronic back to back ear infections. The doctor recommended we have tubes put in, but I asked for more time to experiment by going dairy free. He’s never had an ear infection since, and my 3 year old has been dairy free his entire life and has never had an ear infection. Interesting to see that you noticed a correlation as well! I had tubes put in, too Sarah! It wasn’t until I was older that they realized it was from dairy, unfortunately. But at least I know now! Glad you found the solution for your little one before putting tubes in! You all are so cute! And awesome log of your daily reboot. We just love GoodBelly too and found it when looking for a safe, probiotic for my son. The individual shots are adorable with their little smiley faces and their juice cartons make it just as easy to reach for instead of other drinks. I especially love adding GoodBelly to our smoothies! Ah thanks Nicole. 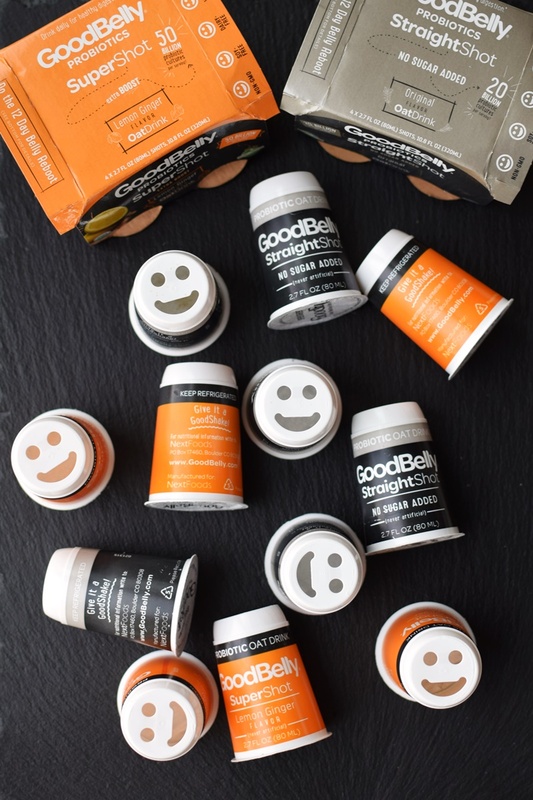 They seriously created the perfect packaging for GoodBelly – you can’t help but smile! If you have had antibiotics then you really need this! It helps to naturally repopulate the good bacteria in your gut! Agreed! And even if you haven’t, our guts take a lot of abuse! Loved reading about your experience! Both Joe and I (and the kids) are totally regular and don’t usually have belly issues unless we eat something we know our bellies don’t like (which is rare). But it’s great to know these things are out there! Great job on the review. I love that you did the challenge together. I only ever had tummy problems before I was vegan. Since being vegan no problems what so ever but i will keep these in mind if I ever do! Awesome that you found a great fix for you Mel! That is so awesome that you do everything together! I love this challenge! I might have to join in soon! We did the challenge last year and kept going for a few months until they got harder to get the shots in stores. As of the end of last year I think Target completely stopped selling them as they redid things and I don’t see a spot for them. With so many of us in the house doing it there was a lot to keep on hand and the drink cartons the girls were drinking more and they were pretty sweet. We still mix them in with other probiotics and use them for smoothies but don’t do our daily shots. That’s a bummer. I have to admit, people talk about buying all these great dairy-free foods at Target, but our local store doesn’t have a thing! I’ve been buying them at Whole Foods and Natural Grocers recently, but have also seen them at Raley’s, which is a fairly mainstream grocer in our area. Tony would totally drink more if I bought the juices, which is why I stick to the low sugar shots. He likes them, and they’re portion-controlled 🙂 They do have a probiotic pill version of GoodBelly now, too. I just put our family on a round of probiotics after we were all sick with the stomach bug for 12 days. They definitely help improve gut health especially after illness! That’s fantastic, I’m glad the probiotics are helping your family and that you’re all well now Laura. The holidays were a doozy for sickness this year! I’ve been researching probiotics and digestive enzymes lately. These sound just like what I need right now. I wonder if we have an equivalent in Germany. That’s a good question! I’m curious to hear if you find anything Kortney. Sadly, I’m pretty sure GoodBelly is just in the U.S. right now. Interesting article! Now that we’re learning so much more about probiotics and gut health, I’m definitely a lot more cautious when prescribing antibiotics to my patients. Unfortunately many people still insist on antibiotics (even when it’s not the proper treatment) without realizing that there are negative side effects. I couldn’t agree with you more Sonali. I’ve got a close family member who gets prescribed antibiotics just when she and her family have a cold! Luckily, the doctors Tony and I have now are much more cautious about these prescriptions, like you. That is so sweet that you and your husband enjoy spending so much time together – my husband is a chef and we don’t blend well in the kitchen 😉 Anyways – I love seeing the results of this challenge, I have heard good things about Good Belly and will definitely be picking up some next time i’m at the grocery store! Well, I suppose that has its own benefits with him cooking and making great food! Glad this has been helpful for you and hubby! The 12 day challenge sounds like a great way to give this a try. Will look into it more. Thanks for the great review! This is so interesting! I think my hubby needs to try this. 🙂 I’m always regular and don’t really experience any tummy troubles, but I’ll keep these in mind if I ever do! He definitely should! Tony was really happy with it. 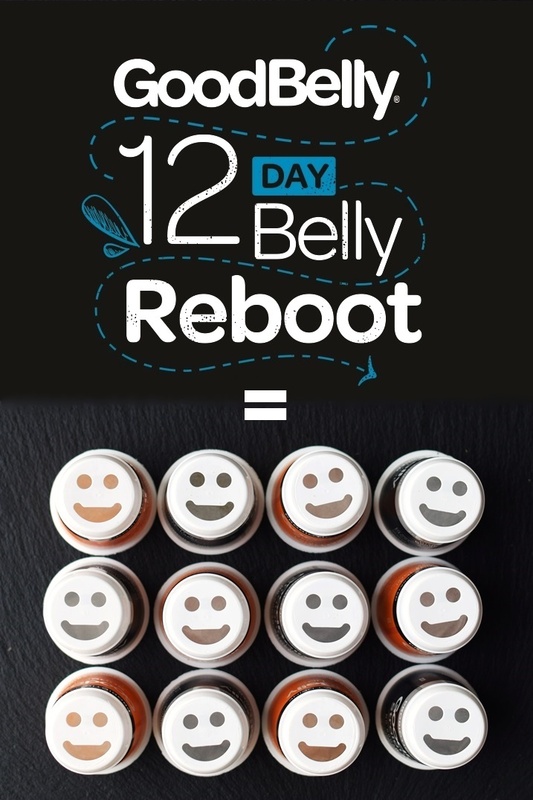 They have a really good coupon on their Reboot Challenge website for the event -> http://12day.goodbelly.com/ – definitely worth printing – especially since I saw it on sale this week too! Oh how fun! I love GoodBelly! My husband did their challenge, and it was great for him. I didn’t realize that Good Belly is cheaper than supplements! I should do a 12 day reboot because I had to take antibiotics for a sinus/ear infection. I’ve been taking the pills, but I’m sure they’re not as good as Good Belly. Honestly Dianne, I would have assumed the pills were better. But we’ve seen way bigger differences with these than any probiotic pills we’ve tried in the last couple of years. That’s awesome that you had such good results! I’m a big fan of a quality probiotic every day. Thankfully I don’t have digestion issues but so many people don’t realize how messed up their gut is from antibiotics, birth control and other drugs! Maybe you are doing so well with gut health because of that daily probiotic! And yes, unfortunately for many of us, the problems started in childhood before any consumer knew what a probiotic was! And often, antibiotics are unavoidable. We definitely need tasty weapons like these! I LOVE Good Belly!! I wasn’t sure when I first heard about it because how could it be dairy free?! But it is and it’s so good, I don’t use it enough because of the cost. Thanks Amanda! That’s where I was so surprised. You can get low count probiotics for cheap, but it is actually less expensive than other comparably high culture pill-based probiotics. 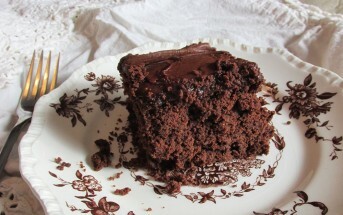 Since we’ve been looking for a more potent one, it definitely fits for our budget & is easy to take since it tastes good!